Nose: Initially fruity with a potpourri of pears, yellow apples, bananas and juicy oranges. Lovely inebriant with a tender alcoholic bite. Toffee and delicate notes of butterscotch arrive, nicely mingling with subtle oak, hints of salt and a fresh whiff of sea breeze in the back. Palate: Bold, intense and nicely warming start on the palate with oak spice, black pepper and allspice, complemented by a discreet creamy sweetness. Less fruity on the palate as the nose suggests. Stewed fruit's coming through, rather dark fruits than the yellow ones on the nose, followed by drying notes of oak and a touch of ginger and anise towards the finish. Finish: The finish is long and creamy sweet with a warming mix of oak spice, pepper, and caramelised ginger. Becomes significantly dry on the tail with a hint of sea salt. With water: On the nose, lots of yellow fruit's coming through with a splash of water, while the oaky spiciness and the alcoholic bite almost disappear. Smooth, soft and elegant on the palate with yellow fruits, tangerines and quince in particular. The warming spiciness is significantly tamed while more dry notes of oak and allspice arrive towards the finish. The finish is a bit shorter, slightly warm and creamy with oak, pepper and ginger. Soft stewed yellow fruits on the tail. 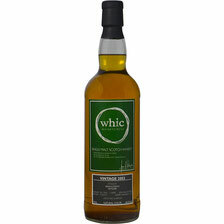 Comments: This nice 25 years old bottling of Bruichladdich is well-rounded, balanced and complex. A lovely and delicate summer malt, with the right amount of soft fruit and warming spice. The alcohol is almost perfectly tamed. It's fantastic for its age, having retained the signature freshness, especially on the nose. Indeed a cheery summer sunset dram. Nose: Fresh on the nose with delicate cereal notes, vanilla, toffee and a hint of floral flavours. Pleasant yellow fruits arrive with apricots, pineapples, passion fruit and citric notes. This is lovely accompanied by sea air and a whiff of spiced oak. Palate: Sweet and oily on the palate with creamy notes of vanilla and caramel. Instantly, a significant warming spiciness of oak, black pepper and ginger emerges, slightly pushing the filigree fruitiness of apricots, poached pears and lemon in the background. Finish: A medium long and pleasantly warm finish. Notes of creamy vanilla, caramel, dried apricots, aniseed, and spice intermingle with dry oak on the tail. With water: On the nose, there's more fruitiness coming through with a few drops of water. Lovely citric notes, pears, yellow apples and apricots are dominating here. Fresh and fragrant. Creamy, sweet and fruity on the palate with pears, poached apples, and apricots, complemented by a restrained warming spiciness of oak, white pepper and stemmed ginger. The finish is medium long and slightly warm with a delicate mix of creamy vanilla, sweet yellow fruits, aniseed and dry oak. Comments: A lovely and highly savoury Laddie. Perfect symbiosis of the fresh, oily, floral and fruity distillery character with delicate vanilla, toffee, tropical fruit and oak spice derived flavours of a good bourbon cask. Only 9 years of age but already rich, firm and characterful. I like it! I thank Arne Wesche from Whic.de for sample and photograph! Nose: The nose starts off with delicate fruits - apricots, melons, and gooseberries, mixed with a lovely hint of strawberries in the back. Cereal notes emerge, accompanied by subtle pepper and a touch of raisins. Minerally, with spiced oak and a whiff of peat. Palate: Bold, rich and surprisingly spicy on the palate. Sweet and fruity flavours of mainly apricots and melons nicely intermingle with black pepper, cloves and oak spice. This is followed by salted caramel, milk chocolate and fine nutty flavours, all gently covered by subtle peat smoke and a whiff of sea air. Finish: The finish is long and warm with sweet flavours of apricot jam, lovely balanced with notes of salted caramel. Gentle peat smoke lingers with soft spiced oak on the tail. With water: On the nose, the yellow fruitiness is slightly tamed with a few drops of water while sweet notes of malted barley, lovely mixed with fine peat smoke are coming through. Water significantly decreases the spiciness on the palate, leading more creamy fruitiness to the fore. Tender notes of pepper and oak deliciously linger with a whiff of peat smoke towards the finish. The finish is medium long with alternating sweet and salty flavours wrapped in gentle peat smoke. Comments: An especially characterful Laddie - lively, expressive, and very enjoyable. Well balanced with a lovely variation of sweet, fruity and spicy flavours, perfectly wrapped in gentle peat smoke. 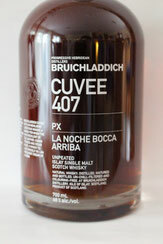 The use of an obviously refill sherry cask leaves the fruity flavours of Bruichladdich to express themselves more freely. A savoury dram with a firm body, a significantly maritime influence and noticeable Islay character. Nose: Fruity with red currant, strawberry, gooseberry, and slightly sour red grapes as well. Sweet flavours of dessert wine along with brown sugar, hints of toffee and gentle oaky spice with a whiff of earthy/rubbery tones. 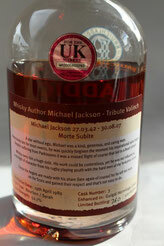 Palate: Very sweet at the beginning with lots of red fruits, strawberries and lingering vanilla. Suddenly a boost of sour red currant and a hint of sulphur is coming through just for a second or two, before the sweet fruitiness takes the upper hand again, along with walnuts and gentle toffee. An amazing alteration of flavours on the palate. Finish: Pretty long and warming. Sweet with lingering toffee and vanilla. Coats your mouth for hours without any disruptive bitter flavours. An excellent and very enjoyable mouthfeel. With water: Oh boy, this is much more vibrant with prickling spice! There is this bitterness of red grapes right at the beginning before the sweetness takes over again. Rich and sweet with a long finish. Comments: A bold, intense and very complex dram with an amazing alteration of sweet and bitter flavours. Luckily, the sweetness is the winner of these two opponents in this tribute valinch. I think, Michael Jackson would have liked this one as well. Nose: Huge aromas of sherry. Big and rich with a melange of dark cherries, raisins and toffee. Sweet marmalade, black treacle, dark chocolate and a hint of tobacco spice. All the great flavours you get from a delicious PX sherry cask. Palate: Oh yes, this one hits your tongue with lots of sherry flavours, sweetness from dark ripe fruits and Demerara sugar. Raisins and nutty aromas mixed with cinnamon and German lebkuchen spice. Thick, sticky but very smooth, even silky with a delicious mouthfeel. Finish: Medium length. Powerful with warm sweetness and a pleasant nutty aftertaste. Lingering spice and brown sugar, joined by espresso and oak. With water: Vibrant with increased spiciness. Stays sweet with sugar and fruits. Pleasant nutty tones. Comments: A bold and intense sherried whisky. Very smooth and delicate. Dangerously drinkable! Enjoyable from the first whiff to the very last sip.